I am moving into a new work space for all (well, most) of my 3D printers, equipment, filament, tools, parts, etc. I call it The SublimeLair! 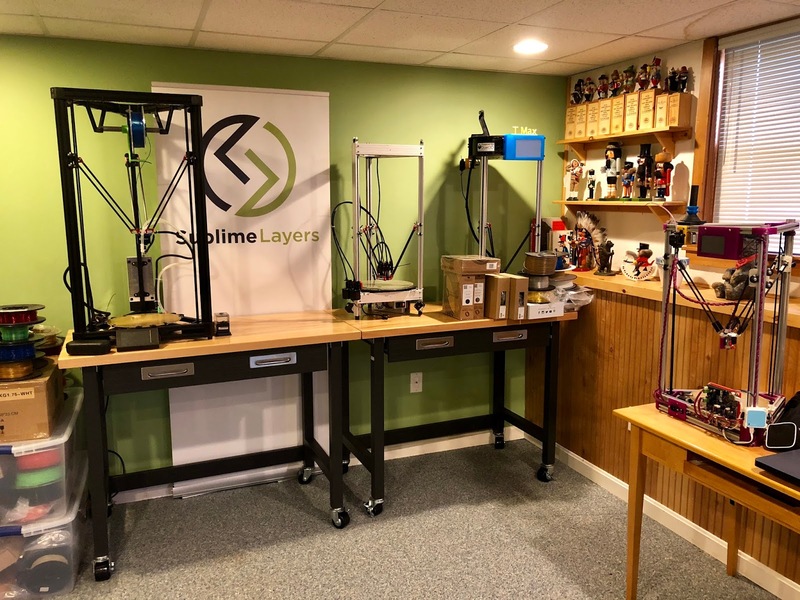 I've been cramped in my small office as the number of printers, filament and piles of related hardware continued to grow over the years. Then, last year, I added in quadcopters and that took over more space. Now we've finally ousted my daughter's cat from the downstairs family room and had the carpets steam cleaned. I'm removing all of the kids' junk and replacing it with mine. So just outside my PFF (personal fabrication facility - i.e. my machine and workshop), I'll have the SublimeLair where I can produce YouTube videos undisturbed, print, ponder, have a workbench to spread out and have more orderly storage for the 100+ spools of filament I currently have (I'm running on low supplies). And I'll have a space for my two Palette+ s with dedicated four-spool filament racks for each. Exciting times, exciting times! 3 comments to ''The SublimeLair!" That's gorgeous. Can you tell me what type of table you are using (the tables with wheels)?